Enjoy the natural beauty of the Mosel and Rhine rivers during this twenty-night tour, meandering through both the Mosel and Rhine valleys with their rolling hills, stunning scenery, dramatic vineyards and quaint villages and towns. As well as the scenic attractions, we will also enjoy great local cuisine and wines throughout the tour. 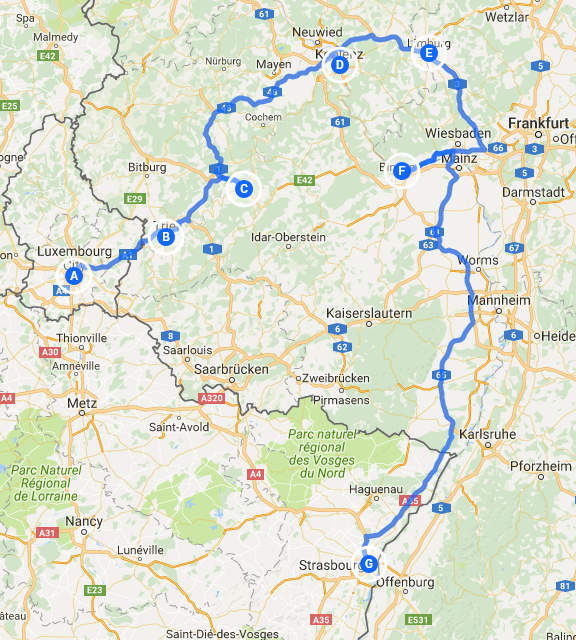 The tour begins in Luxembourg from where we travel to Trier and our campsite located directly on the banks of the Mosel. 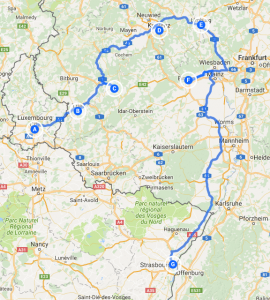 Continuing our leisurely journey, we follow the course of the majestic Mosel, to Bernkastel-Kues and then onwards to Koblenz. Along the way, we will pass by the many vineyards and beautiful villages which border the river. This entire area is a cyclist’s paradise, so if you have a bike please bring it along. On reaching Koblenz our campsite is located directly at the confluence of the Mosel and the Rhine. From Koblenz, we make a small detour to visit the delightful old town of Limburg an der Lahn before re-joining the river Rhine at Rüdesheim am Rhein where we will have time to explore this charming town, and sample the local wines and culinary treats. Strasbourg, our next port of call, is the capital and principal city of the Alsace region and is the official seat of the European Parliament. Strasbourg’s historic city centre, the Grande Ile (Grand Island) was classified as a World Heritage Site by UNESCO in 1988. From our conveniently located campsite we will visit the city for a guided tour, dine in a traditional Alsatian restaurant in “Petite France” and take a leisurely cruise on the river whilst enjoying lunch. ‘We would never have found the wonderful places Alan & Chris took us to. All we had to do was plug in the co-ordinates and head for another beautiful stopover. The whole trip was totally stress-free and absolutely brilliant. Thanks, we are ready to book another. The tour begins in Luxembourg. Those travelling independently should aim to reach the campsite during the afternoon. This evening we will meet at the Tour Director’s van for welcome drinks, introductions and a tour briefing. This morning we make our way to the Porta Nigra – the magnificent 2nd Century City Gate, where we will meet our guide who will take us on a walking tour of the city focusing principally on its Roman legacy including the Imperial Baths and Amphitheatre. After our guided tour there will be free time for lunch, sightseeing or shopping before returning in your own time to the campsite. We will be collected this morning, from the campsite, by an Open Vintage Tourist Bus for a journey up through the steep vineyard slopes to the castle ruins which overlook the town. Once we reach the castle we will have time for exploration and photographs before continuing our journey back through the vineyards and into town. Once back in town, there will be some free time before we meet for lunch in a restaurant located in the heart of the town. After lunch, more free time for sightseeing before making your own way back to the campsite – about 2km of level walking, or take a local taxi. Free time this morning. You may choose to stay on the campsite and relax, walk back into town for further exploration, or if you are a cyclist, explore the surrounding area with its many miles of flat, easy and safe cycle routes. This afternoon we will visit a local wine producer for a Presentation and Tasting accompanied by a selection of sausages and cheese. 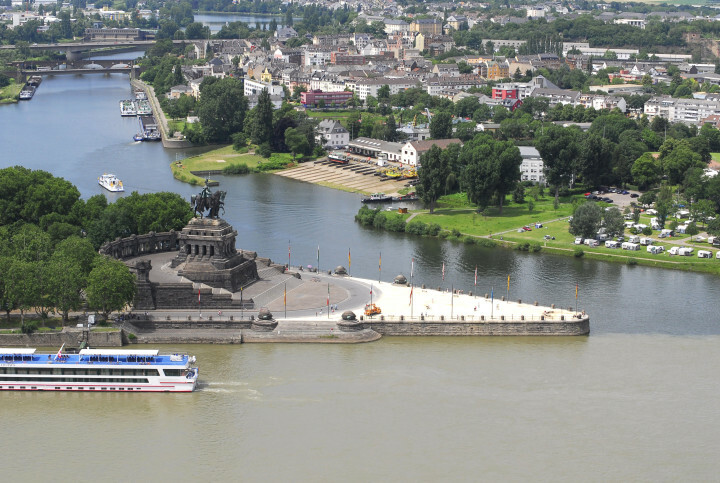 This morning we will take the passenger ferry across to the Deutsches Eck (German Corner) where we will meet our guide for a tour of the most important parts of the city. The afternoon is free for you to further explore the city. This evening we will have a group dinner with wine in the campsite restaurant. A free day today. Take the opportunity this morning to visit the Ehrenbreitstein Fortress with its amazing views over the city and its wonderful exhibitions. To reach the Fortress you will travel over the Rhine on the BUGA cable car, built as an attraction and an environmentally friendly means of transport specifically for the “Bundesgartenschau 2011” (Federal Horticultural Show 2011). A free day today -Take a short stroll along the banks of the Lahn into the historic town centre and enjoy the interesting architecture and the many Timbered Buildings. Visit the amazing Castle and Cathedral or stop at one of the numerous pavement cafes/bars/ restaurants. This evening the Tour Directors will hold a “Cheese and Wine Evening” at their pitch so we can all enjoy some local produce. This morning we will stroll into town for a group visit to Siegfried’s Mechanical Music Cabinet Museum which houses an amazing collection of over 350 musical instruments. After our museum visit you will have free time to enjoy this enchanting town. Rüdesheim is a town that offers many opportunities for the tourist and the Tour Directors will be able to advise you on the various options thus ensuring that you enjoy your day to the full. Day Fourteen – Tuesday 22nd May A free day today. After a leisurely start to the day you could take the Ring Tour which offers fantastic views around Rudesheim and the Niederwald Forest. The tour comprises a short ride on the cable car from the town followed by a walk along peaceful forest paths before taking the chair lift down through steep vineyards to Assmannshausen where you board a river boat for a 45 minute cruise back to Rudesheim. This evening we will walk into town for a Group Dinner in one of the restaurants in the famous Drosselgasse. You are invited to join the Tour Directors on their pitch this morning for a Group Breakfast and Get-Together after which you will have free time to further explore this lovely riverside town with its many tourist attractions including the famous Asbach Distillery and visitor centre. Using public transport (tickets provided), we will travel the short distance into town where we will meet our guide for a tour of the historic part of the city. Following on from our guided tour we have lunch in a restaurant located in the “Petite France” area. After lunch, there will be free time for further sightseeing and exploration before returning to the campsite in your own time. A Free Day today enabling you to relax on-site and catch up with some chores or using the excellent public transport to make your way back into the city for further sightseeing or shopping. A Free Day today. As our tour is coming towards its end we will all meet this evening for drinks and a buffet at the campsite terrace/bar. This will be the opportunity to recall those special moments on the tour. Our final day of the tour. Mid-morning, we will take the tram into town and the Quai Des Pecheurs where we board a River Boat for a cruise around the historic city centre whilst enjoying a Gourmet Lunch accompanied by local wines. Following our cruise there will be the opportunity for that final bit of sightseeing in this wonderful city before returning in your own time to the campsite. The tour ends this morning, all subsequent costs incurred are your responsibility. If the Tour Directors are returning to Calais, you may accompany them by a route and timings of their choice.